I know a lot of you call me a Koala Bear, even my scientific name Phascolarctos cinereus means 'ash-coloured pouched bear'. But I’m not a bear. I’m a marsupial mammal. 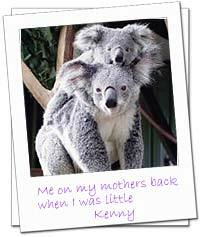 That means female koalas have a pouch where they keep their baby. The giant wombat was one of my prehistoric ancestors. Although I’m bigger than my koala cousins from up north, I’m not fat. We grow bigger down here in the south and have thicker fur because it’s colder here. My fur is soft woolly grey, with patches of white on my stomach, chest and chin and a fringe of white around my ears. I have big fluffy ears and a very large nose. I have a very small tail but it’s hidden by all my fur. And before we go any further, I’ve heard all the big ear and big nose jokes, so get over it, ok. A lot of people think I am cute. I’m about 34 inches (85cm) tall and I weigh about 30 pounds (14kg). My hands have two thumbs and three fingers and really sharp claws. The thumbs and claws help me with climbing trees and gripping branches. Two of the toes on my feet are joined together by a large claw. This comes in really handy for combing my fur. My big toe doesn’t have a claw. 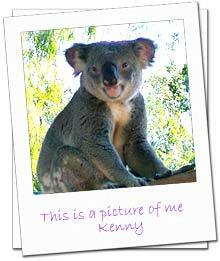 Some people think my life is boring because I spend up to 20 hours a day sleeping or resting in a eucalyptus tree. But it’s much safer up there than on the ground, where I could be hit by a car or attacked by a dog. On cold days I curl up into a ball to keep warm. On hot days I lie on a branch and let my arms and legs dangle to catch any cool breeze . When I’m on the ground I walk very slowly but if I'm threatened I can break into a run and can spring up onto a tree. I'm a really fussy eater and only eat eucalyptus leaves. They are also known as gum leaves. I use my big nose to sniff out my favourite leaves. Eucalyptus leaves are poisonous to a lot of animals but not to me. I have special teeth to grind the leaves into a paste before I swallow them, and then my stomach and intestines take out the bad stuff and help me digest them. I love the really juicy tips of the leaves. I eat so many eucalyptus leaves that my fur smells of eucalyptus. I get most of the moisture I need from eucalyptus leaves. The Australian Aboriginals call me ‘Koobor’ which means ‘does not drink’. When I was born I was very tiny, only about the size of a jellybean. I couldn’t see or hear. I had to climb across my mother's fur into her pouch. It was really hard making that trip but once I got there I could drink her milk. I was in her pouch for about six months. Now this is going to sound gross, but after 6 months my mother produced a special poo that she smeared over her fur. I licked it off. Told you it would sound gross. But it had lots of good things it in that helped me grow and get ready to eat eucalyptus leaves. While I was little my mother let me ride on her back. Koalas don’t say a lot but we can talk and yell very loudly when we want to. Well, I have to go and sleep now in my favourite tree. If you are trying to find what tree I'm in, have a look on the ground at the bottom of the tree for my droppings.